WiFi that works Say goodbye to dead zones and video buffering with the Nokia WiFi Beacon 3! The Nokia WiFi Beacon 3 extends the whole home Wi-Fi experience for broadband subscribers providing seamless roaming without any disruption from every corner in your home. 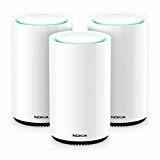 Expand your coverage by adding additional Nokia 3 Beacons to create a whole home coverage mesh network backhauled by either wired Ethernet or Wi-Fi (2.4GHz or 5GHz) to ensure flawless roaming for mobile users. The intelligent, self-organizing mesh system provides real-time access by re-routing your device traffic past any network problems in as little as 500ms giving you maximum Wi-Fi speed and peak performance. Nokia’s intelligent mesh technology ensures 100% coverage with no deterioration in performance when new beacons are added. Its peer-to-peer architecture eliminates the need for a central controller and ensures fast and seamless roaming. The wireless performance is measured in real time, and the network is dynamically adjusted to improve coverage and capacity. Real-time spectrum analysis detects up to 17 interference sources (Bluetooth speakers, microwaves, cordless phones, etc.). Machine learning is used to understand the unique technical and usage characteristics of every device in order to provide the optimal connection to each. Nokia WiFi is self-healing (re-routing in under 500 milliseconds), self-optimizing (dynamic path selection), and self-organizing (plug and play). It automatically detects and resolves connectivity issues before customers are even aware of them, which means a lot less headaches and a lot more productivity. High Performance Wi-Fi For Your Whole Home – This is NOT your average wifi mesh network or internet extender. The Nokia Beacon 3 is a next generation wifi mesh network system delivering blazing fast internet speed and real-time optimization. Intelligent, Real-Time Mesh Network – The intelligent, self-organizing, self-healing mesh system provides real-time access by re-routing your device data past any network problems in as little as 500ms to offer maximum internet speed and performance. Say goodbye to DEAD ZONES! Secure, fast coverage can be expanded at any time by installing additional Wi-Fi beacons to ensure flawless, room-to-room roaming and point to point wireless for mobile users. Easy Mobile App – Manage multiple mobile devices, computers and smart IoT accessories like speakers, TVs. Control and share your wifi access at the touch of your fingertips. App available on the Apple Store or Google Play markets. Easy Installation – Enjoy plug and play setup in minutes, whether adding your first beacon or expanding your mesh wifi system with additional units. NOTE: The layout and construction of your home may affect the estimated coverage shown below.